At risk of going up a particularly geeky, Open Source software blind alley, I'm going to prove why certain technology isn't exactly consumer-friendly. 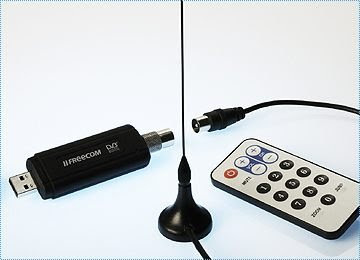 You may have seen our previous articles on using the Freecom DVB-T (freeview) USB2 stick on Linux. I was going to try some different media players on my newly resurrected TV tuner on Ubuntu 12.10 when something strange happened. The device is still listed when you run lsusb to probe for hardware. The firmware wasn't creating a hardware interface to the operating system, hence no adapter folder for the device. So the firmware version which had worked, must be incompatible, my dear Watson. In search of the most up-to-date firmware (Windows users - read that as 'drivers') version for the Freecom (slash Hama, slash Yakumo) stick, I had installed version 03, by downloading and copying the firmware into the appropriate folder. Inserted the USB stick and the LED lit up orange, so I went ahead and tuned it to watch the news. One day and one software update later - nothing. Diagnostics revealed nothing, all the firmware was in the right place; cables, USB ports all checked out. Version 02's firmware is still available in this package: http://linuxtv.org/downloads/firmware/dvb-firmwares-20110802.tar.bz2. So diving into the folder /lib/firmware, I cleared out all the old firmware files (anything with dvb in the title), dropped the version 2 firmware into it and restarted. Note you need root (admin) permissions to fiddle with that system folder. What do you know, the LED on the TV-tuner comes back on! My preferred player, VLC, throws an error the first time you change channel, but otherwise, we're back in business.